Scientists at Natcore Technology have developed a black solar cell that absorbs 99.7% of available sunlight. This is a significant improvement over the anti-reflective coatings now used on solar panels. Natcore has an exclusive patent license from the U.S. Department of Energy’s National Renewable Energy Laboratory (NREL) to develop and commercialize a line of black silicon products--including equipment, chemicals, and solar cells—based on NREL patents. Natcore’s exclusivity covers the field of diffused emitters with liquid phase passivation. Why Care about Black Solar Cells? “Black solar” refers to the apparent color of the surface of a silicon wafer after it has been etched with nano-scale pores. The etching takes place in a matter of a few minutes in a liquid solution at room temperature. Adding the pores increases the amount of light absorbed by the cell. When nearly all the light is absorbed the cells appear totally black. For solar cells, minimum reflectivity is desirable because sunlight that is reflected, rather than absorbed, is "wasted." The reflectivity of a polished silicon wafer surface approaches 40%, giving the wafer its shiny appearance. Adding the industry's typical anti-reflective coating reduces the average reflectivity to approximately 6% and gives the cells their distinctive dark blue color. Black solar cells have been studied since the 1980s because of their potential for significantly improved performance compared to standard production cells. But a key obstacle to turning their increased light absorption into increased power output is a significantly increased area of exposed silicon on the sidewalls of the pores and on the small mesas that remain at the top surface of the wafer itself. This increased area must be passivated, or treated to keep it from trapping the light-generated electric charges as they migrate toward the contacts of the solar cell, a process that robs the cell of output power. To solve this problem Natcore's process began with an uncoated, textured silicon wafer that had an average reflectance of approximately 8%, giving it a mottled gray appearance. First, nanoscale pores were etched into the wafer surface by submerging it for a few minutes in a liquid solution at room temperature. Next, using the company's liquid phase deposition (LPD) process, Natcore scientists filled the pores and then over-coated them with silicon dioxide. This combination step both coated and passivated, thereby allowing lower reflectance. After the surface treatments were completed, the wafers were taken to the State of Ohio's Photovoltaic Research and Development Center at the University of Toledo, where the reflectance was measured. Conventional cells, with anti-reflective coatings made via a chemical vapor deposition process that requires a high-temperature vacuum furnace and hazardous gases, have a reflectance of about 4%. With black solar cells, the U.S. Department of Energy's National Renewable Energy Laboratory (NREL) lowered the number below 2%. Now Natcore's technology has reduced it to 0.3%, or virtually zero. Natcore technician Rich Topel admires a wafer of "absolute black" silicon, which absorbs so many photons it could become the workhorse of the solar industry. Quantitatively, reflectance is the proportion of light striking a surface that is reflected from it. Thus a reflectance of 0.3% means that only 0.3% of incident light is reflected from the solar cell's surface, while 99.7% of incident light is absorbed by the cell and is available for conversion into electrical energy. But there are additional benefits to be derived from using black silicon. A panel made from black solar cells will produce significantly more energy on a daily basis than will a panel made from cells using the industry standard antireflective coating. First, because it reflects less light. Second, because it performs better during the morning and afternoon hours when the sun hits at an angle. It also outperforms standard cell panels on cloudy days. "Natcore’s ability to passivate black solar cells using their liquid phase deposition (LPD) technology has been the missing piece. 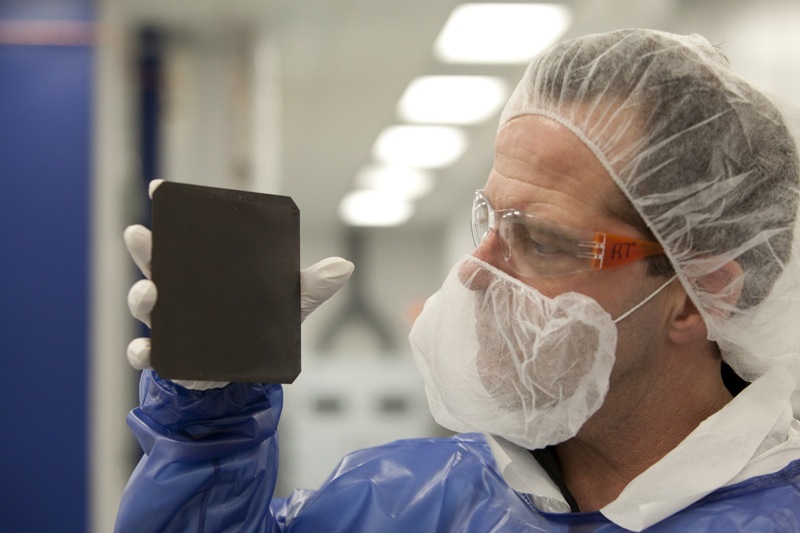 It's what will enable black silicon to reach its potential," says Dr. Dennis Flood, Natcore's Chief Technology Officer." So don’t be surprised when you start seeing solar panels made from black silicon cells start turning up on roofs near you. To learn more facts and advice about a wide variety of solar related products and issues - use our built-in site & blog searching tool below. We have written more than 700 articles to help you get the most benefit from the sun. Back from this page on the new black solar cell to our Home Page.